Clashes in Nigeria between farmers and semi-nomadic herders have killed more than 3,600 people since 2016, most of them this year, Amnesty International said on Monday, in a report documenting an upsurge in violence that could sway the results of February 2019 elections. Muhammadu Buhari is seeking a second term in those elections, but his campaign has taken a hit from accusations he has soft-pedaled justice for one of the sides responsible for the clashes, the herders, many of whom come from the same Fulani ethnic group as the leader. The presidency has repeatedly denied those allegations. 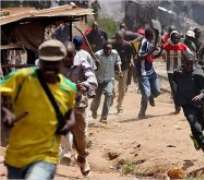 The violence is often painted as ethno-religious: chiefly Muslim Fulani herders clashing with mainly Christian farmers. But many experts and politicians say climate change and expanding agriculture are creating competition for land that is pushing the farmers and herders into conflict, regardless of faith or ethnicity. “The Nigerian authorities’ failure to investigate communal clashes and bring perpetrators to justice has fuelled a bloody escalation in the conflict between farmers and herders across the country, resulting in at least 3,641 deaths in the past three years and the displacement of thousands more,” Amnesty said in a statement. Nigeria’s military and police did not respond to request for comment. Of the 310 attacks recorded between January 2016 and October 2018, 57 percent were in 2018, the rights group said. After a quieter wet season in the summer, experts now fear clashes could surge again as the dry season begins, forcing herders to move south towards greener land and water supplies, often across farmland. Any increase in violence would coincide with the February 2019 vote. “These attacks were well planned and coordinated, with the use of weapons like machine guns and AK-47 rifles,” said Osai Ojigho, Amnesty’s Nigeria director. “Yet, little has been done by the authorities in terms of prevention, arrests and prosecutions, even when information about the suspected perpetrators was available,” she said. The farmer-herder conflict killed six times more people than the war with the Boko Haram insurgency in the first half of 2018, the International Crisis Group said in July. “In some places, because of the failures of the security forces, competition over resources is used as a pretext to kill and maim along ethnic or religious lines,” Ojigho said. “The conflict has also been dangerously politicized by some state government officials who have inflamed tensions by embarking on a blame game along political party lines,” said Osai Ojigho.